Make your own treasure map, fashion a pirate hat, design a jolly roger, answer a pirate questionnaire, label and colour a pirate ship…and more! 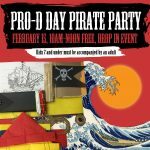 Choose your own pirate activities during this free, drop-in event. Kids 7 and under must be accompanied by an adult.